Designed by Westmacott and built by Woodnutts in 1922. Details of her early years are not known but after her first major refit in 1983 her history has been well documented. 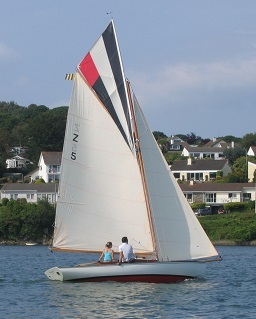 In 1983 the new decks and coachroof were fitted and a new rig design put in. 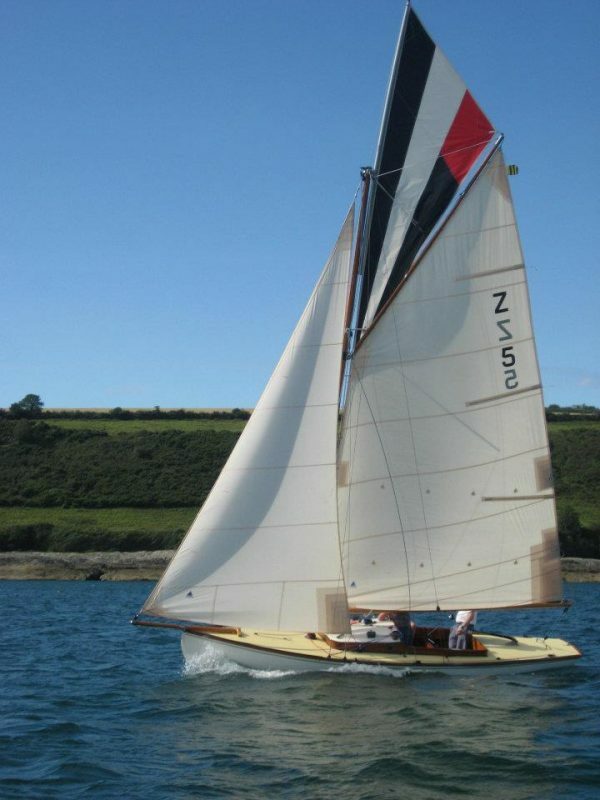 After this she was kept locally in Falmouth until 2009, raced successfully for periods of time. 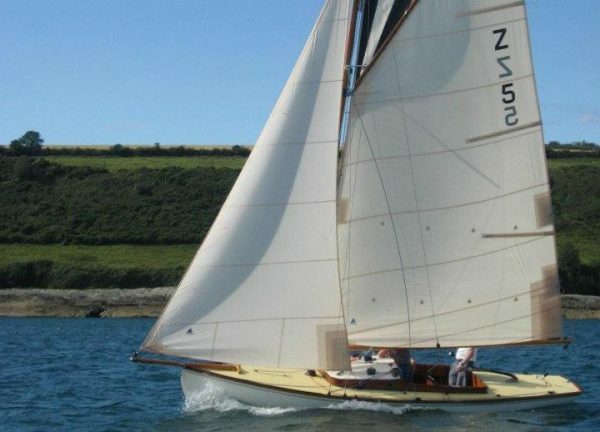 Bought by the present owners in 2009, she had a further refit to optimise her for racing, mainly with adjustments to the rig and fittings, during this ownership she has been very successful winning many local cups. 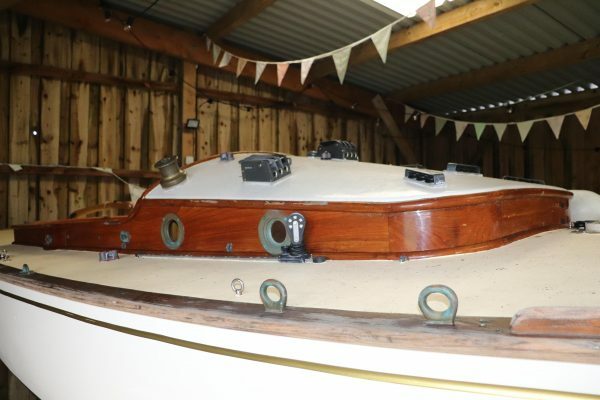 In 2018 she had another period of professional work where the keel was removed and re-bedded with new bronze bolts plus new laminated oak floors were fitted to strengthen the hull once again. She was surveyed in September 2018 and a copy of that report is available. 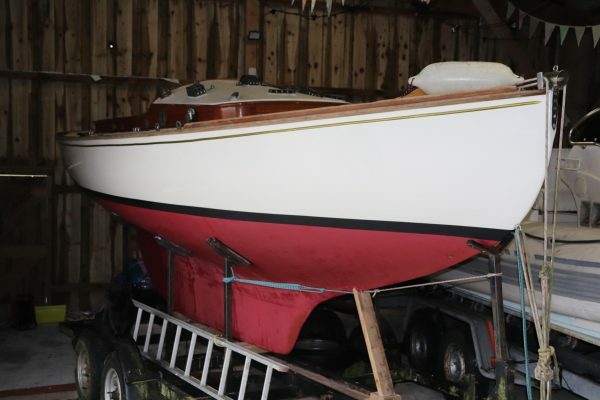 This is a very attractive yacht, exciting to sail and a joy to own, fresh from some significant work she is on a heavy duty road trailer and will make a fantastic fun boat to get some great value summer sailing. Planked in 11/16″ pitch pine all copper rivet fastened to steam bent oak timbers at 6″ centres. 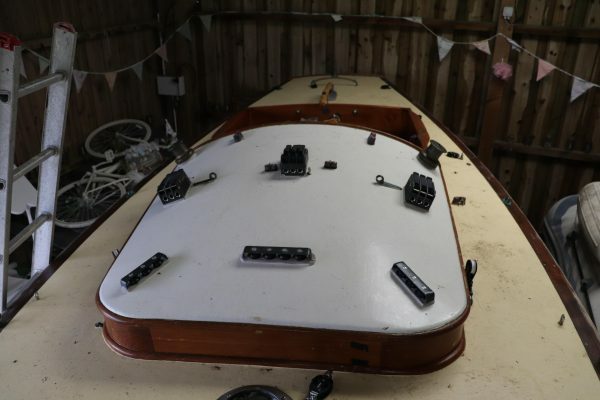 The hull was treated in 1983 by soaking it inside and out with a thin epoxy resin after a long period of drying. 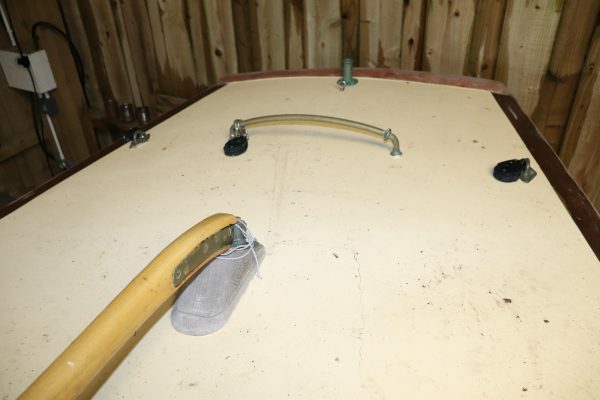 There is no glass cloth or sheathing on the hull. 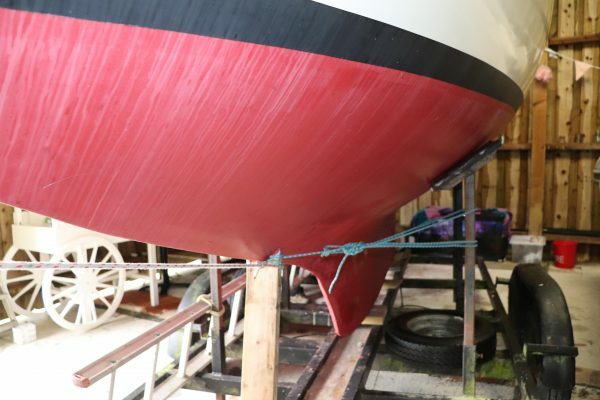 External lead ballast keel with bronze keel bolts, all replaced in January 2018. Laminated oak floors across the centreline with long arms either side, all new in 2018. 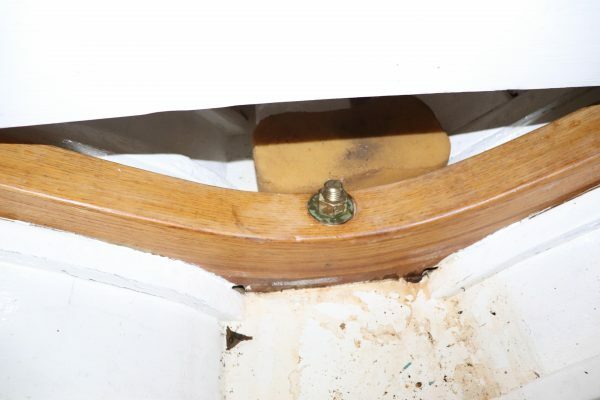 The keel bolts pass through the floors for added strength. 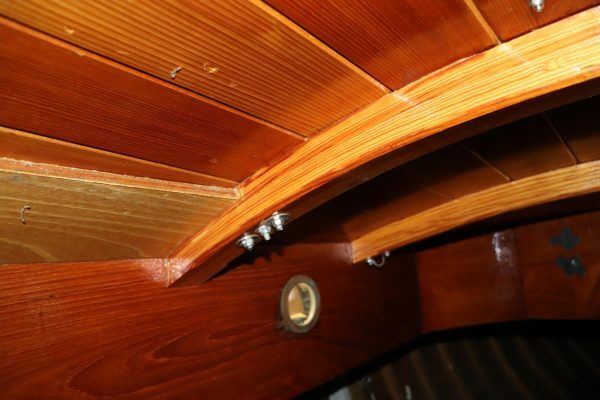 1/2″ marine plywood deck over pine deck beams, epoxy sheathed externally. Finished in cream deck paint with a varnished teak cover board all round and a varnished teak toe rail set slightly in from the deck edge. Stainless steel stem head fitting with twin bow rollers and gammon iron. Varnished teak coamings around the cockpit and coachroof with a painted plywood coachroof deck. Various turning blocks and jammers mounted on the coachroof. The decks and coachroof were all fitted during the major refit in 1983. 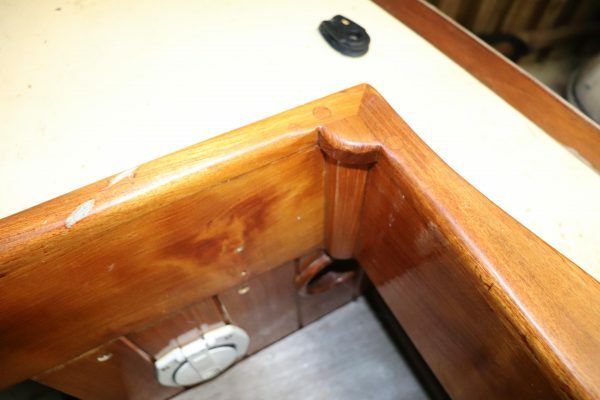 Deep non self draining cockpit with varnished teak all round. 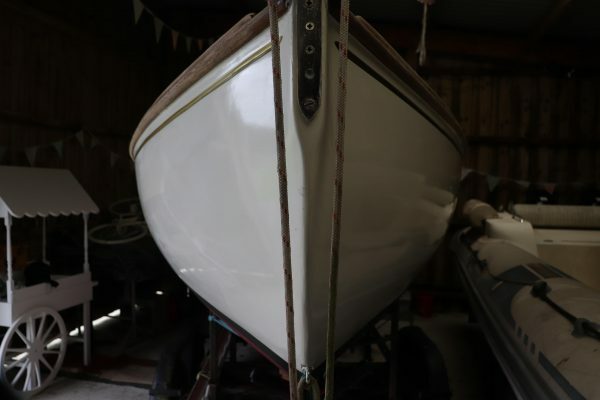 Scrubbed teak thwart across the aft end and in each forward corner. 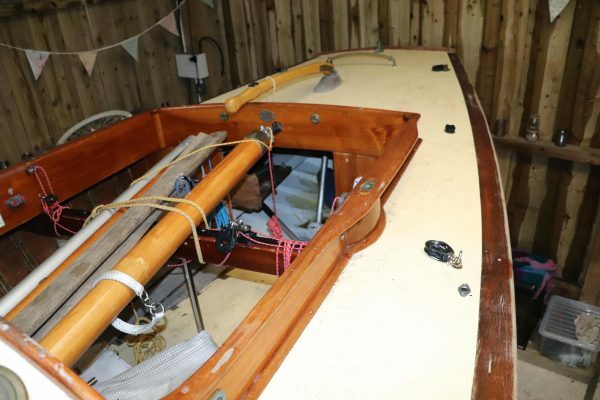 Mainsheet traveller splits the cockpit, could be removed if not racing. 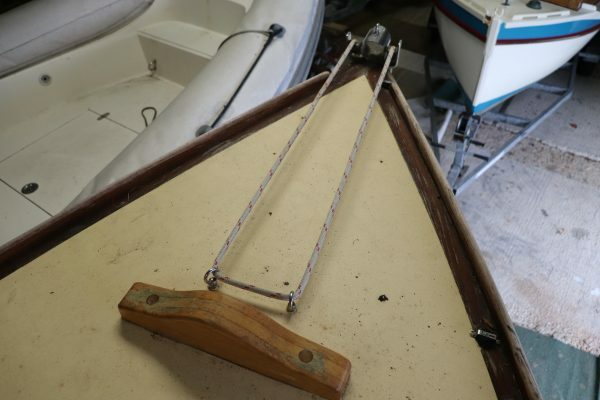 Tiller steering with a stainless steel rudder stock. Rig is commonly known as a ‘slutter’, able to sail as a sloop or cutter and was designed by Gerry Dykstra. Fractional gaff slutter rig on a keel stepped hollow spruce mast. 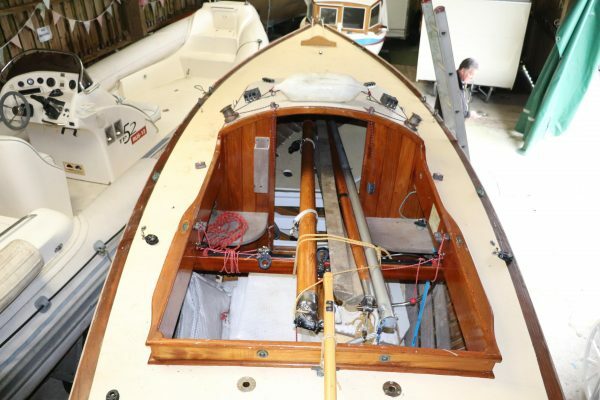 Varnished spruce boom and bowsprit with a lightweight aluminium gaff yard. Stainless steel rigging, 10 years old, with stainless rigging screws to internal bronze chain plates. 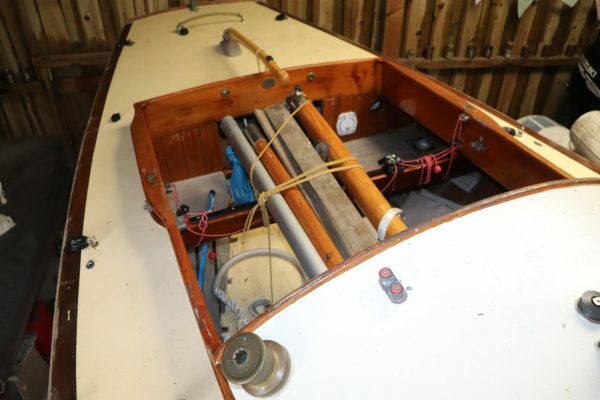 Heavily modified for sailing with lots of modern Harken and Spinlock equipment to improve the control of the rig and make her easier to sail. The mainsheet tail has been led forward to a turning block on the boom and down to a traveller across the cockpit. Running back stays on tackles. 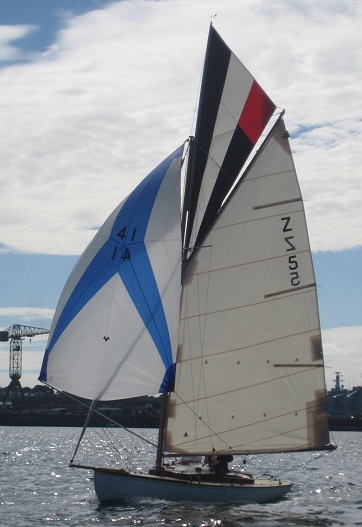 Bartells roller furling system on the jib. Running rigging all replaced in last 3 years. 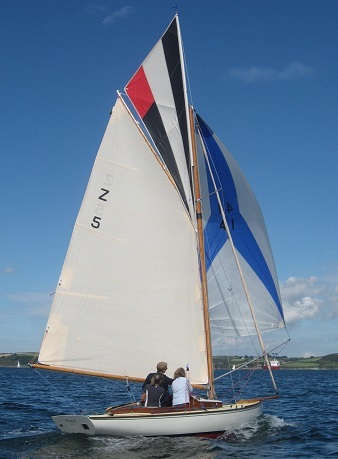 Full set of sails from SKB, Falmouth all in good condition including a fully battened mainsail, topsail, No.1 jib, No.2 jib and 2 spinnakers. 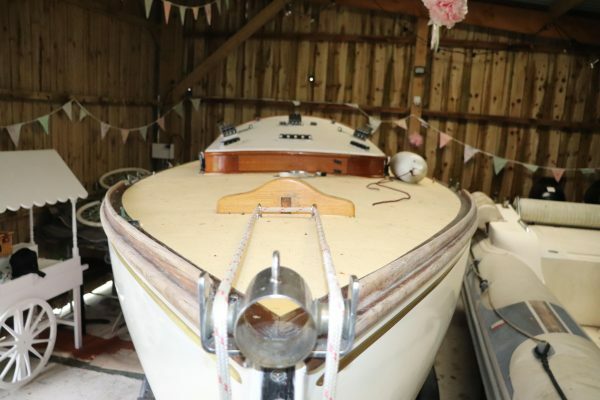 There is no internal fit out as the boat has been used primarily for racing, however there are sole boards and space to fit a berth either side which would allow sitting headroom under the coachroof. Also ample space for stowage of fenders and gear up forward.